We started feeding Waffles Virbac C.E.T. oral hygiene chews a few months ago. These chews are made of dried beef hide. I bought these because a fellow dog owner told me she was feeding these to her dog to help with dental hygiene. I bought the medium pack based on the recommended weight. The pack comes with ~30 chews - apparently there isn't much quality control on these as the pieces range from thin rectangles to rather thick large pieces. I cut the large pieces in half as I didn't want Waffles eating so much at a time. The beef hide softens as your dog chews on it. Because the chews are so hard and dry, Waffles uses his back teeth and really goes to town with it. 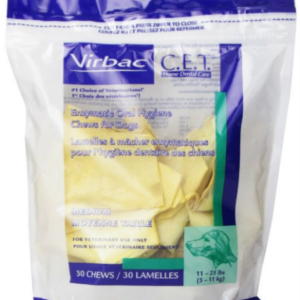 The chews are supposed to help reduce plaque and tartar and get rid of bad breath. Waffles can spend 15-20 minutes on the chew, which is a good amount of time that he has on his own while we eat dinner! Waffles loves these chews - he gets really excited when we pull the bag out of the pantry and enjoys gnawing on it. I'm not sure how much salt is in these, but Waffles does get thirsty after eating these. He usually goes straight for the water bowl after he's done. These don't have much of an impact on his digestive system - some days he'll have a larger poop than others but it's hard to tell when the beef hide has made its way out. Also want to note, if you are interested in buying these, I would recommend you purchase the size based on the recommended dog weight. After seeing how the medium pieces could vary in shape and size, I bought the small size hoping for some consistency with the product. Waffles devours the small size so quickly (in 5 minutes) that I don't think it's effective in any way.